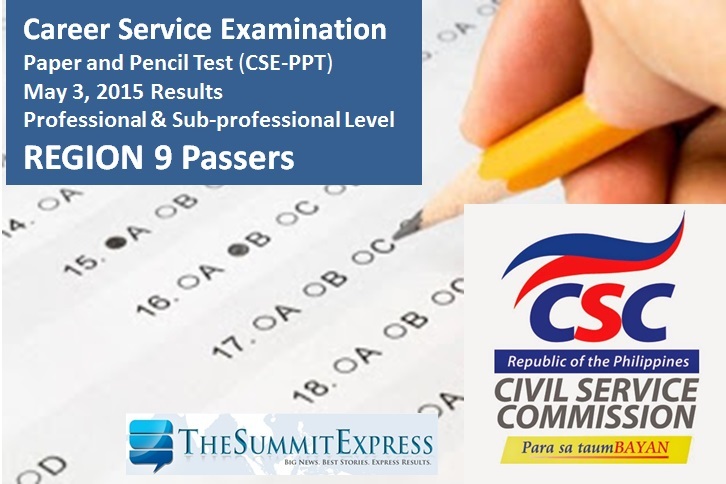 The Civil Service Commission(CSC) officially released today the results of May 3, 2015 Civil Service Exam - Paper and Pencil Test (CSE-PPT) also known as Career service examination. The full List of passers out of more than 180,000 examinees who got at least 80% average grade for professional and sub-professional levels is available here. The list of passers for Region 9 (Zamboanga Peninsula) for the Professional and Sub-Professional Levels are available below. The CSC named a total of 52 new passers for the sub-professional level. UPDATE: Official results for Professional Level announced by CSC on Monday, June 15.